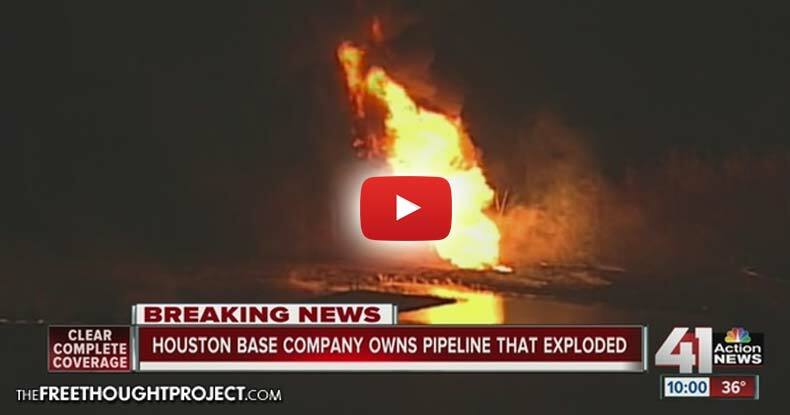 A pipeline explosion that caused a large fire in Platte County, just north of Kansas City, on Tuesday evening, clearly revealed exactly why the water protectors at Standing Rock are standing up against the Dakota Access Pipeline. The pipeline, operated by Mid-America Pipeline Company, thankfully ruptured in an isolated area near the Kansas City International Airport, causing a massive explosion and fire – but no injuries. Plumes of fire and heavy smoke were showing from the scene and lit up the sky from miles away. An hour after the fire started, it was still burning, but the flames had reduced significantly. The fire was burning itself out a short time later. A crew from Mid-America Pipeline Company came to shut off the valves so the pipelines’ mix of ethane and propane didn’t fuel the fire. The pipeline explosion highlights exactly why thousands have shown up in Standing Rock to support the #NoDAPL movement. While this pipeline explosion ruptured on private property in an isolated area, if a similar incident were to occur near the Missouri River, it would decimate the water supply of the Standing Rock reservation. Exposing the highly unreliable nature of the fossil fuel infrastructure, Mid-America Pipeline Company’s parent company Enterprise Products Partners, at the end of October 2016, shut down its Seaway Crude Pipeline, a 400,000-barrel per day conduit, after an oil leak near Cushing, Oklahoma, but did not provide an estimate of the volume of oil spilled. “Seaway personnel continue to make progress in cleaning up the spill, substantially all of which has been contained in a retention pond at Enbridge’s facility,” the company said in a press release. EPP noted that the pipeline is a “50/50 joint venture” between Enterprise and Enbridge Inc. Enbridge, in concert with Marathon Oil, hold roughly a 37 percent stake in the Dakota Access Pipeline. These hollow words by an energy company would offer little comfort to the Standing Rock Sioux if the DAPL were to leak poison into the tribe’s source of drinking water. Mid-American Pipeline Company was fined $1,242,000 in 2012 for an unspecified environmental violation. The cause of Tuesday evening’s explosion has yet to be determined but is under investigation. Standing Rock Sioux water protectors and Native Americans and Indigenous peoples from over 200 tribes and their supporters fear that pipeline’s route — undercutting the Missouri River in several places — threatens to poison the tribal water supply and that of no less than 18 million others living downstream. “Oil pipelines break, spill, and leak—it’s not a question of if, it’s a question of where and when,” 13-year-old Anna Lee Rain YellowHammer, a member of the Standing Rock Sioux Tribe, wrote in a petition to stop the DAPL. It seems crazy that a 13-year-old can have a better understanding of reality than the proponents of the DAPL, but perhaps that is due to the fact that they have vested financial interest in seeing oil flow, while she cares solely about the health and safety of her family, friends, and neighbors. This latest explosion only serves to highlight why there is such vehement public opposition to the Dakota Access Pipeline. Please share this story as a wake-up call to all of the dangers inherent to building a pipeline under this vital source of drinking water for the Standing Rock Sioux!